(1) BRADBURY IN FUNDRAISER BOOK. 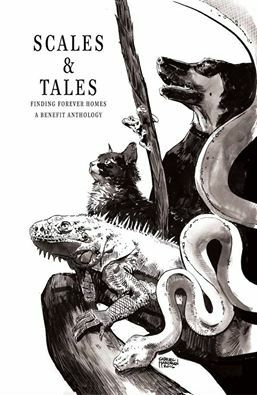 William Wu Books is publishing Scales & Tales: Finding Forever Homes, an anthology edited by John Palisano, in time for Comic-Con. The proceeds will help animal adoption programs. This will be available at the San Diego Comic Convention in our booth, 5627 located along the back wall of the exhibit hall, at the end of the 2400 aisle. This trade paperback will be limited to 500 numbered copies. We will start announcing our lineup in the next few days. But we will start with one of our favorites authors. We are pleased to announce that we will be printing a Ray Bradbury story, The Cat’s Pajamas. Clive Barker, Len Wein and Tim Powers are among the others with stories in the book. (2) BEWARE SPOILER. J. W. Ocker was innocently reviewing the proof of his upcoming Salem book…. 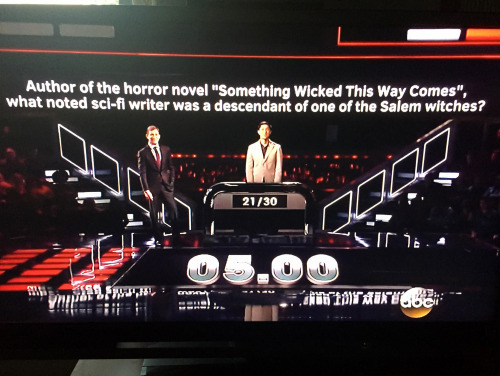 Okay, he was really watching primetime gameshow 500 Questions on ABC, when a Ray Bradbury question popped up. He posted a screenshot on his blog. Spoiler: The author is Ray Bradbury; the witch, Mary Bradbury. (3) HE HAS A LITTLE LIST. “Ray Bradbury on How List-Making Can Boost Your Creativity” from Brainpickings. These lists were the provocations, finally, that caused my better stuff to surface. I was feeling my way toward something honest, hidden under the trapdoor on the top of my skull. THE LAKE. THE NIGHT. THE CRICKETS. THE RAVINE. THE ATTIC. THE BASEMENT. THE TRAPDOOR. THE BABY. THE CROWD. THE NIGHT TRAIN. THE FOG HORN. THE SCYTHE. THE CARNIVAL. THE CAROUSEL. THE DWARF. THE MIRROR MAZE. THE SKELETON. (4) GEOGRAPHY LESSON. 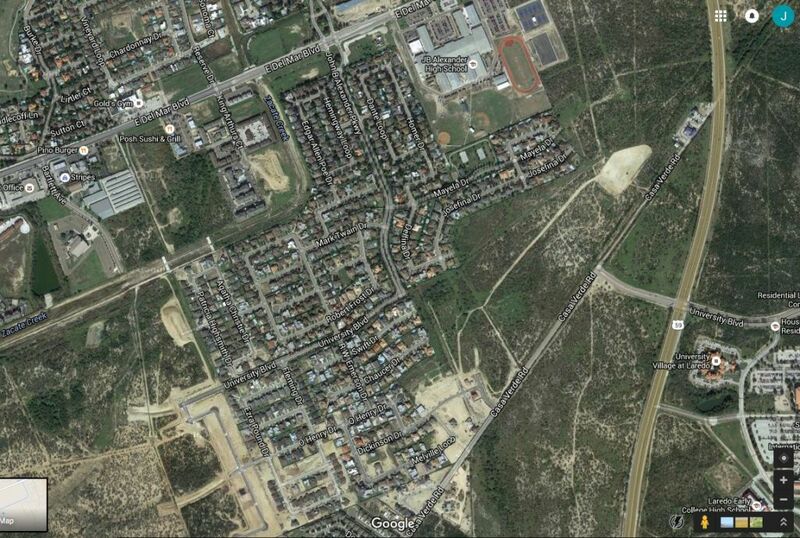 There is a Ray Bradbury Drive in Laredo, TX (near Texas A&M University). Look at the other literary types with street names. (6) VOICE OVER. Here’s a 90-minute memorial tribute to Charles Beaumont. Yes the narrator is who it sounds like. (7) ALWAYS REMEMBERING. Today, June 5, is the fourth anniversary of Ray Bradbury’s passing. My eulogy: “A LASFSian Remembers Ray Bradbury”. An amazing thing is that even with his ever-increasing fame, speaking schedule and strenuous writing workload Ray remained cordial towards his fans. I think he actually reveled in his fame, one of the fruits of his success as a writer, but he was an incredibly generous spirit by nature, who gave his time and attention to any cause he felt indebted to – such as the libraries where he’d educated himself – and paid forward the encouragement and mentoring he’d received as a young, unpublished dreamer. …. He clearly relished an audience, speaking often at libraries, universities and civic events. He spoke at USC during my freshman year, the first time I got his autograph. That was 1970, and Ray had already shaped the basic autobiographical speech that he continued to present til he was 90, about his childhood memories, the art he loved and his successes as a writer. That day he said, “I wanted to become the greatest writer in the world. Aren’t you glad I finally made it?” The audience cheered like mad. This entry was posted in Like Show Business and tagged J.W. Ocker, Ray Bradbury by Mike Glyer. Bookmark the permalink. Ironic, considering how much Bradbury hated cars. (Ditto a Ray Bradbury TV or a Ray Bradbury iPod.) Maybe there should be a Ray Bradbury Walk? ETA: Speaking of Bradbury and game shows, I’m sure you are aware of the time he was a contestant on You Bet Your Life? The segment is on Youtube. Darren Garrison: ETA: Speaking of Bradbury and game shows, I’m sure you are aware of the time he was a contestant on You Bet Your Life? The segment is on Youtube. Oh yes, we’ve linked to that more than once — and certainly will do so again! That SCALES & TAILS cover appears to be b Hugo nominee Gabriel Hardman. Hi Kurt, yes the cover is indeed by Gabriel Hardman. We also have a story by his wife in the chapbook that will be given out with purchases made at SDCC at my booth. Len Wein will be in the chapbook, not the trade paperback. However, there is a new Marv Wolfman story in the book.